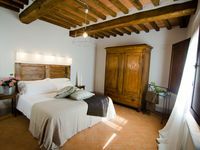 Beauty And Serenity In A Premium Montalcino Location That Will Sleep 4 Adults. Property 55: Beauty And Serenity In A Premium Montalcino Location That Will Sleep 4 Adults. Pienza - Lovely 3BR Apartment in Borgo with fantastic views and fabulous pool. Property 90: Pienza - Lovely 3BR Apartment in Borgo with fantastic views and fabulous pool. Outstanding apartment in the heart of Montepulciano, loved everything about it. Location was great, parking at P6 lot was convenient, and the rooftop terrace was delightful. We stayed for 3 days in mid-October when the crowds were less and parking was plentiful. This apartment was a great base not only for exploring Montepulciano, but for day trips to Montalcino, Pienza, Cortona, etc. The apartment was light and bright and very clean. Would definitely book again.